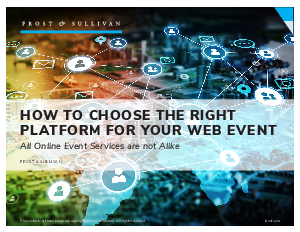 Web events are an excellent communications technology for businesses that want to cost-effectively get their message out to a large, often global audience. Low prices, easy access and a variety of valuable features are helping companies use online technology to drive their marketing, sales, training and corporate communications efforts. Big data is also transforming how webinars are delivered, driving an increasingly compelling user experience and achieving better ROI. Rich analytics and real-time reporting during the event provide detailed data on attendee behavior, which can then become the basis for lead qualification, targeted content and effective engagement measurements.